This was a treat I bought for my amazing bestie. Is bestie still a word that is acceptable to use over the age of five? It is a perfect choice for birthdays, as a unique gift experience or a very classy hen party. Though I am sure they would not be offended if you wanted to wear pink L plates all day. Boringdon hall is one of my favourite manor house hotels in the Southwest. Located on the edge of Dartmoor, the 16th century building is the perfect combination of grand and welcoming. Perhaps I should have hoovered my car before the lovely valet parked it. I hope he ignored all the snickers wrappers. You are greeted by your event organiser and taken to the great hall where you are treated to a glass of bubbly and advised of your itinerary for the day. The staff at the hall are second to none, approachable, helpful, and courteous. They are one of the reasons I keep going back. Watched over by portraits of King Henry you have a 1-1 session with the chef who talked us through the history of all that is chocolate. I can now correctly pronounce cacao bean. In a lovely quiet area overlooking the hall we were provided with a range of chocolates. White, milk, dark, melted, nuts, popping candy…there is such a generous amount of ingredients! Introduced to some fantastic techniques, it is encouraged that you sample the flavours, get a little messy rolling truffles, and laugh a lot. I couldn’t take too many pictures as I got very sticky. And frankly, the ones I did take were a little off par because of all the bubbly consumed. Let’s just say I don’t have an alternative calling as a chocolatier. This session lasted a couple of hours and we were able to take all our chocolates home afterwards in gorgeous gift boxes. An advisory note, don’t wear white. Boringdon is a gorgeous place to dine. The classic gallery restaurant offers fantastic service. Included in the package is afternoon tea, a delectable feast of fruit scones, handmade cakes and finger sandwiches washed down with a range of specialty loose leaf teas. Or champagne. When in Rome… The servings were very generous so I had tartlet for tea that night. Yes I asked for a doggy bag, I am classy. In a fabulous finale, the day ended with a 1-1 lesson with one of the many knowledgeable, friendly bar staff. Or mixologists if we are getting technical. You pick your spirit and get shown how to make three different cocktails. We each had our own equipment and were patiently talked through each cocktail and shown the steps to make our own. I did almost throw a shaker at my own face. They do not scrimp on measures. You are then left at your leisure to drink said cocktails. We chose to wonder round the beautiful gardens. 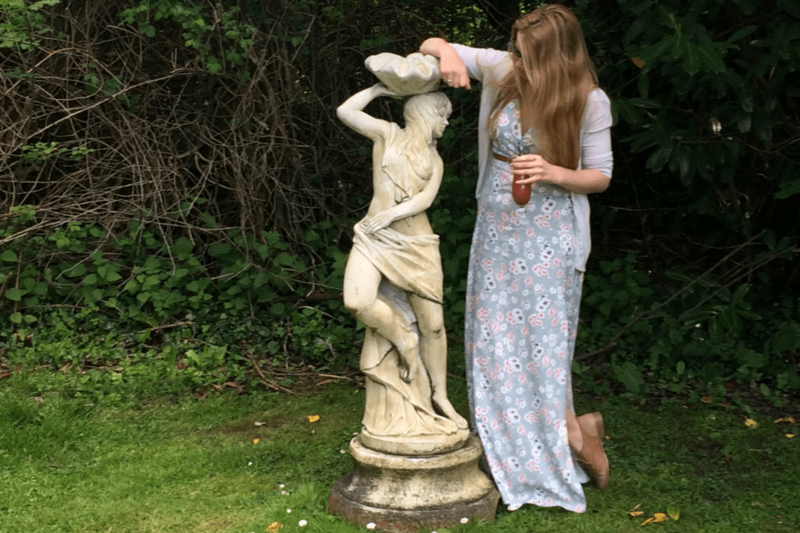 I made a statue friend. Note, I did not know how many beverages were included in the cocktail making. I drove. Big mistake. If you buy a ladies day invest in getting one of their lovely rooms. Safety first I plied my cocktails onto my exceedingly happy friend and left some for the bar staff as soon as they were off shift. Next time I am drinking them all. You can also complete the evening with a fine dining experience in the Gallery restaurant. If you hadn’t over indulged and had space left after all the cakes and chocolate.